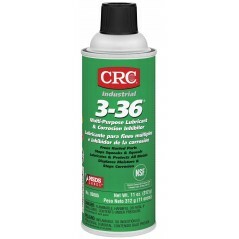 CRC 3.36 is a multiple organic inhibitor in a paraffinic oil base that prevents rust and corrosion by displacing and sealing out moisture and by forming a continuous protective barrier against water and oxygen. CRC 3-36 Film never dries or becomes brittle. Penetrates into the pores and cracks. Does not have to be removed before welding, machining, or processed. Removes readily with CRC Lectra Clean or CRC Braklean. CRC 3-36 Low surface tension and an affinity for metal, ensures that a continuous film of product will blanket every part of the surface.CRC 3-36 Protects aluminum (Anodised or Mill) and copper from plaster burn and concrete burn. Prevents finger printing, the corrosive action of acids and oils left by human handling. Tubing, castings, gears, weld rod, wire, fixtures, dies, jigs, shim stock, chucks, drill rod, heat treated parts, machined surfaces, finished welds, aluminum extrusions, air actuated tools, conveyors, frozen joints, locks, hoists, etc.